There where thirty-one different ideograms for sheep in Uric Period of Mesopotamia, approximately six thousand years ago. The thick woolly coat of a sheep protects him or her from both the heat and cold. Sheep have appeared on banknotes. 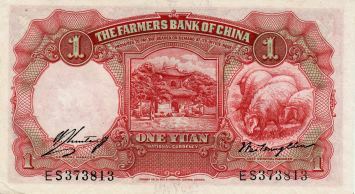 The example below is a 1 Yuan note printed by Thomas de la Rue, London; for the Chinese Nationalist bank, the Farmers Bank of China. Probably printed in 1936-39. Australia currently has over 145 million sheep for shearing and produces 80% of the wool used in clothing. The industry is worth $2.8 billion per year to Australia's economy. The gestation time ( from conception to birth) for a Ewe is five months. The Asiatic Mouflon is thought to be the sole ancestor of modern sheep. There are today still wild Moulflon: the Asiatic Moulflon is today found in Southern Iran and the mountainous regions of Asia Minor and the European Moufloon now only found in the wild on the islands of Sardinia and Corsica. Sheep have an excellent good long term memory, they can remember as many as fifty faces for up to two years and most particularly they have a keen recall of unpleasant experiences. Sheep may be capable of using the same system (as humans) to remember and respond emotionally to individuals in their absenceDr Keith Kendrick, neuroscientist, Babraham Research Institute, Cambridge. The fleece of just one sheep can be spun to produce a strand the length of approximately 200KM. The ancient Egyptians believed that sheep were sacred. They even had them mummified when they died. One years growth of fleece produces approximately 8 pounds of wool. Sheep cannot right themselves from certain positions, therefore if you see a sheep on his back please give him or her some assistance as sheep cannot get themselves upright from this position and if left unaided they will eventually die, within an hour. Sheep have excellent hearing but poor vision. They have a 270˚ radius of view, almost 3/4 of a circle. Humans only see 170˚ at best. Sheep have four stomachs or to be precise four stomach chambers. Sheep are ruminants. This means they digest their food in two steps; first they eat their raw plant food and then regurgitate the semi-digested form called cud, which they than chew and re-swallow. They have four stomach chambers to help with their complicated digestion. Ten percent of the world's sheep are hair sheep, they do not have wool coats. Sheep are common symbols in mythology and religion, please refer to: Sheep in Religion and Mythology. The Ram Aries is the first sign of the Zodiac. Sheep are often used in metaphor such as a 'wolf in sheep's clothing.' Christ is represented by a lamb, a metaphor for gentleness. Rams are used to symbolise virility and power. During Woodrow Wilson residency, the First Lady had sheep graze on the White House lawn to keep it neat and well trimmed.